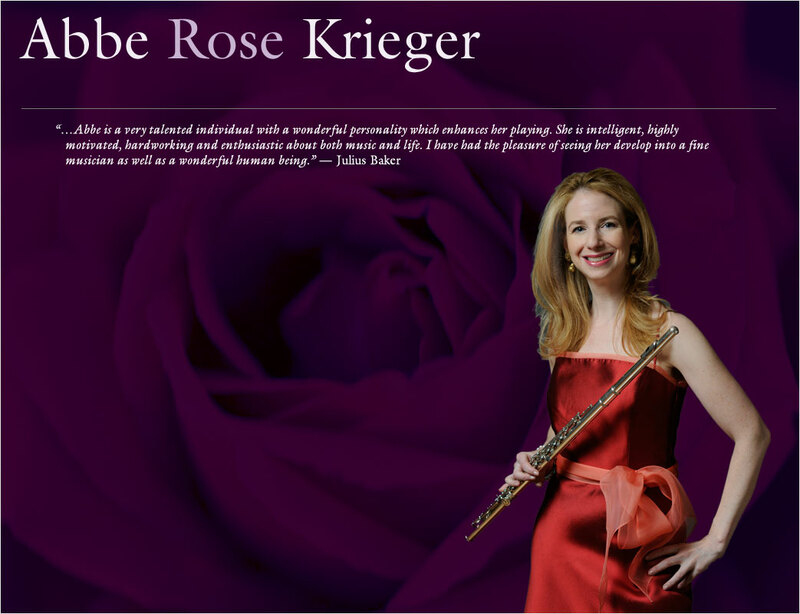 Listeners around the globe have consistently praised the richness and beauty of flutist Abbe Rose Krieger's playing. In addition to performing at Carnegie Hall, Avery Fisher Hall, Paul Hall and the Peter Jay Sharp Theater at Lincoln Center for the Performing Arts, she has appeared at music festivals including Tanglewood, Bowdoin and Chautauqua. Ms. Krieger's solo and chamber recitals have included performances in Los Angeles, Vermont, and Paris, and she has been featured on WQED radio's “Young Artist Showcase.” Currently, Ms. Krieger is in the planning stages of a project to record the complete set of Bach Sonatas for flute and harpsichord. Ms. Krieger's musical training includes degrees with honors from The Juilliard School, Carnegie Mellon University and Brandeis University, where she also served as a flute instructor. A native New Yorker, Abbe Rose Krieger currently resides there and is devoted to making classical music accessible to the broadest audience possible. When not performing or teaching, she loves to run (marathons), bake, and is in the process of completing her first novel. A longtime student and friend of Julius Baker, Ms. Krieger considers Mr. Baker and Glenn Gould (one of Mr. Baker’s favorite musicians) to be among her strongest musical influences.